Details: The answer to some common problems for chicken owners has just arrived! 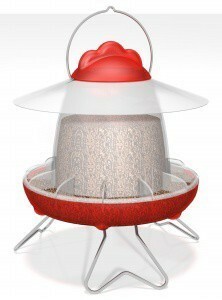 Feathers & Beaky, makers of the natural range of chicken foods, has developed a feeder that addresses many common problems. The product features an anti-perch rain guard that protects the food from rain and prevents chickens landing on the top (as they do!) and tipping it over. Anti-waste guards also help to stop food being thrown out by the birds as they eat. Three strong, metal legs are strategically placed to give stability, even on surfaces that are not flat and they are adjustable to three different heights which means all sizes of poultry can eat in comfort. Not only is the feeder designed for practicality, it looks good too. The special tone of red used makes it an attractive addition to any garden or chicken run.